Below is my card. 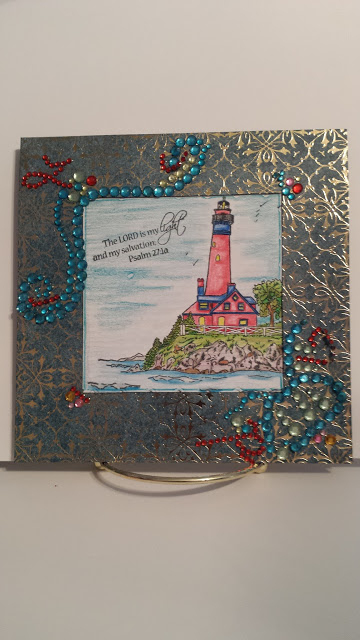 I used the set #1083 Light of the World from Sweet n Sassy Stamps. Love this inspirational set from Korin Sutherland. The image was stamped with Memento Black. Then colored with my color pencils. The frame was a scrap of white cardstock with the gold design embossed into it. I used me dauber and my SU! Midnight Muse and Island Indigo ink pads to give is some color. Then I added rhinestones for embellishment. The sentiment is also from the Sweet n Sassy set.